The term is primarily used in Guatemala and Belize (Matsuda 1998). It is derived from the word ‘huech’ which means ‘armadillo’ in several Maya dialects. 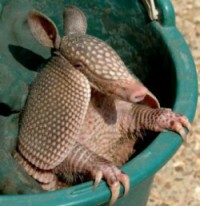 Armadillos are seen as creatures that dig holes in the dirt much like looters of archaeological sites. The use of the term ‘huechero’ usually implies subsistence digging (Matsuda 2005). It is worth noting that the South American term ‘huaquero’, which has a similar definition, is derived from a different source.